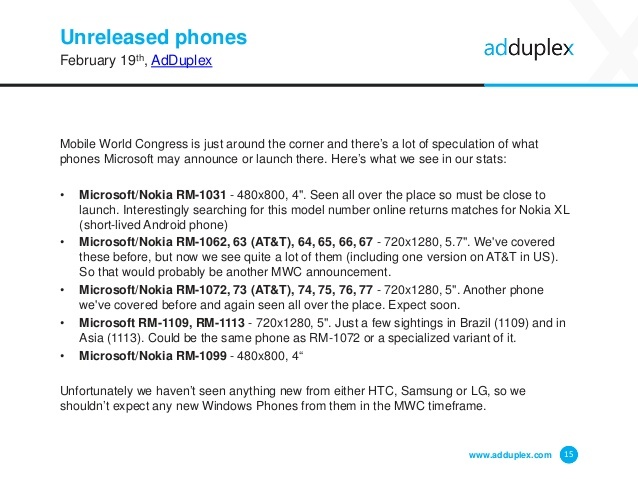 A slide from Adduplex has revealed upcoming of many new Lumia phones. Among the big news, Lumia 640 and Lumia 1330 will be heading to AT&T in United States. It’s not the first that we are hearing about Lumia 640 as this handset recently showed up at Brazil’s telecom certification agency Anantel with model number RM-1109. It’s a 5 inch HD phone with Snapdragon 400 processor with 1 Gigs of RAM and 8.7 Mega pixel main camera, 0.9 mega pixel selfie camera. It includes NFC, LTE, dual SIM connectivity options. The Lumia 1330 and 1335 by Microsoft be equipped with 5.7 inch HD OLED display and comes with 13.1 mega pixel camera with Zeiss optics and 5 mega pixel front shooter. It comes with 4G LTE-A connectivity and Snapdragon 400 processor with 1 Gigs of RAM. The other AT&T phone in the news is the Microsoft RM-1062, RM-1063, RM-1064, RM-1065, RM-1066, RM-1077. All of these phones are with 5.7 inch HD display and the RM-1063 is the AT&T version. Microsoft RM-1031 is a 4 inch phone exactly matching with earlier Nokia phone named as Nokia XL, the first ever Android phone. You might be wondering what’s AdDuplex – its an analytic firm which watches Windows Phone market and provide insight on upcoming Windows phone. All of these smartphones will be announced at Mobile World Congress [MWC 2015] at Barcelona, Spain.